This manual is a reference for service providers working with families living in poverty who have children under age six. 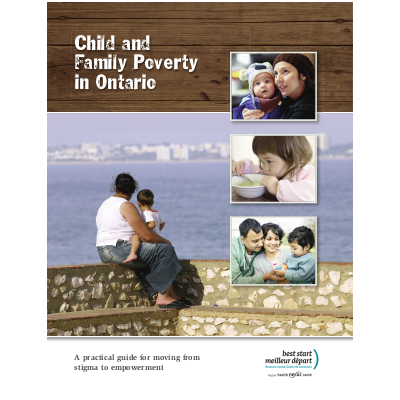 This edition includes updated statistics, policies and practices that can influence child and family poverty, examples of promising approaches to addressing various aspects of child and family poverty and current literature. This manual was written with a wide range of service providers in mind, such as community workers, child protection workers, teachers, health care providers, early childhood educators, social workers and others who interact with families, parents or children. The manual offers an opportunity to reflect on how poverty is defined, the impacts of poverty on families, how service provider practices can help and suggest broader systemic and policy issues that influence families living in poverty.